whether for their directors, clients, partners or employees, to reward and appreciate work well done or to get to know more personally colleagues who work off-site or in other departments. A boat is a mini-company and as such requires – to function smoothly and perfectly, as a well-run company does – leadership, involvement and joint effort. Indispensable too, is unity among the crew, living together harmoniously, empathy, loyalty, communication, teamwork and feeling that the common effort pursues a common goal. The boat can’t sail without its crew, and the crew ashore, without the boat is just another group of people. It’s a mutual dependency. 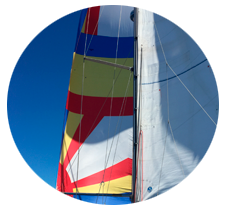 Sailing has helped to strengthen ties and inspired many of our crews, thus fostering that spirit of team so important for the boat – small or large – to follow its course with harmony and be able to discover new routes. 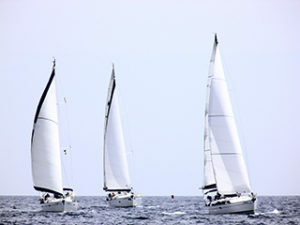 Accompanied by a professional skipper with experience not only in navigation but also in teaching and group cohesion, your team can enjoy a pleasant meeting to enjoy the sea and relax or an exciting experience participating in a regatta with different sailboats. All in a unique scenario: the vision of the city of Barcelona from the sea. 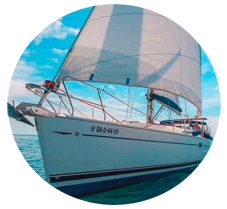 We can completely adapt to your special needs; organize events for small groups of up to 8 – 10 people in one boat or for larger groups in several boats; outings of a few hours, a whole day or a weekend. Contact us and we’ll put together an estimate that suits all your needs.